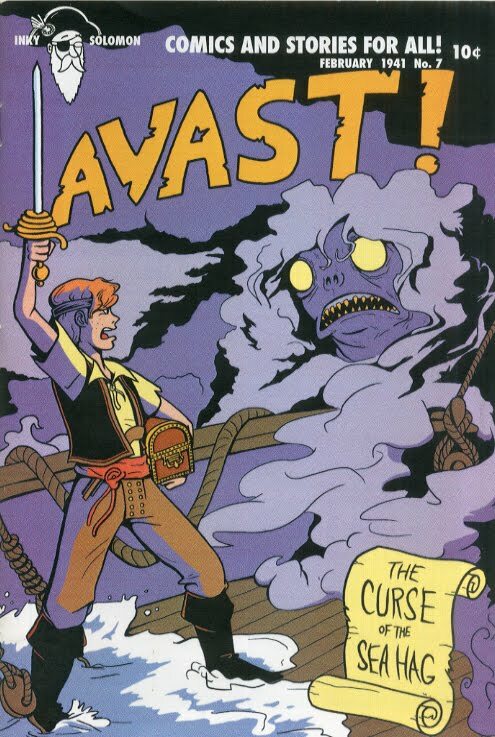 I picked up Avast! while purchasing some other comic-related goodies to give relatives for Christmas. There wasn't much of a description on the site, but it wasn't expensive, so I figured I'd give it a shot. 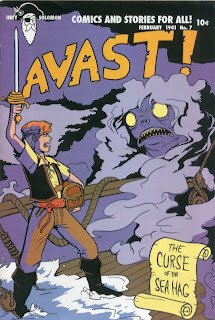 The story follows Cate O'Malley, a pirate under Captain Freeman. They ransack a ship and obtain the legendary Sea Hag's Pearl, which allegedly brings immortality to anyone who holds it. O'Malley takes over as captain once Freeman is killed (having dropped the Pearl) and soon finds herself under attack from the Armada. She also drops the Pearl as her ship is bombarded, but sees it roll overboard. She dives into the deep after it, and she's last seen under the water swimming ever deeper to catch the sink Pearl. The book was a group effort from Amelia Onorato, Donna Almendrala, Bill Bedard, Andy Warner, Nate Wootters and Sean Knickerbocker. They're all credited as writers and colorists, and they all contributed to either the penciling or inking. For as collaborative an effort as it was, it holds together quite well. The art changes between sections isn't invisible, but it's not terribly noticeable either; some of the characters just look slightly off-model from the previous section. The story holds together fairly well. I didn't find the characters terribly engaging, but they weren't exactly wooden either. I was struck, though, by a lot of the details about pirate life that were included. The type of stuff most folks aren't aware of -- like that a cannonball isn't so dangerous in and of itself, but it's the wood splinters that spray everywhere after it hits the ship that are more likely to kill you. There's also some nice continuity touches, like O'Malley eventually wearing a coat much like Freeman's or that she loses her eye shortly before going overboard. The book is treated presented like a Golden Age comic from EC. It's got a message from the "Admiral Inky Solomon", fake ads, Ben-Day coloring effects, and even a February 1941 cover date. It feels a little off, though, but not having the quality level of illustration that was found at EC. You won't be mistaking any of this for Johnny Craig. It's not bad here, but it's a different style altogether. I think that probably hampers the book's impact more than anything; it just doesn't have the visual style of a Reed Crandall or a Wally Wood. All in all, it's not a bad book. I suspect that it was a very educational experience for the creators (who, I think, worked on it as part of a Center for Cartoon Studies class) and it's interesting to see how that turned out. Especially as a collaborative effort. The book is available for $5.00 from Storenvy.